The following is a list of roof maintenance de-icing products from Erick Industries. 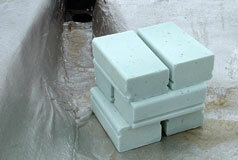 They range in uses, from the Dambuster Deicer Bricks, which are best for private homeowners, to Dambuster 50lbs. blocks, which are more appropriate for commercial roofs. They all perform the same function, however: to stop winter ice from forming and causing expensive roof damage. Additional applications may be needed when there is repeated, excessive precipitation.